Laboratory information management systems is estimated to reach USD 825.6 million by 2024. High growth rate is attributable to development of advanced designs to meet the ever increasing need of biobanks, other healthcare settings and life science industries. Furthermore, easy data maintenance and reduction in data interpretation errors will further strengthen segment growth. Cloud base solutions will grow at CAGR of 8.8% during the forecast timeframe. Cloud technology facilitated labs to streamline operations and save resources, guaranteeing maximum user satisfaction. Cloud solutions is extensively helping biobanks in managing sample and patient data. It is now becoming part of clinical, diagnostics, testing and research laboratories worldwide. Pharmaceuticals segment is expected to grow with CAGR of 8.0% over the forecast period. 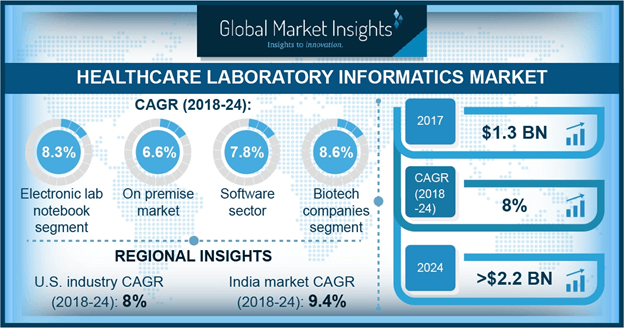 Growing investment in R&D activities leading to generation of huge volume of experimental data will lead to increasing inclination of pharmaceutical companies towards laboratory informatics solutions. Cloud services offer Pharma companies the ability to increase their data storage as required, eliminating the limit imposed by on-site storage, thereby driving segmental growth.